When it comes to the best maintenance for your Subaru, it doesn't take much. After all, Subaru models continue to earn prestigious recognition for their low cost to own. 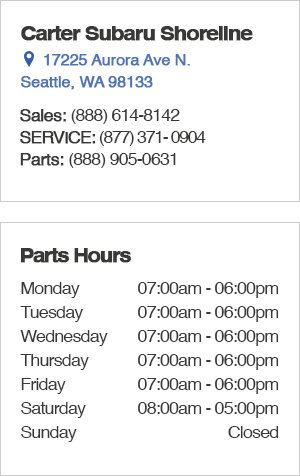 When the time comes to replace old and worn-out belts and hoses, we want to help in our parts department at Carter Subaru Shoreline. Right now, show us this coupon to enjoy 15% off the price of any belts or hoses you might need. Whether your radiator hoses are feeling a little soft or you've noticed some cracks in the drive belt, this is a great chance to save. If your Subaru belts and hoses still have some life left in them, take advantage of this special Subaru parts offer and be ready when it's time for maintenance. We can't keep this discount available much longer, so stop by and see us today at Carter Subaru Shoreline.